The new Collection, which contains an array of apparel and a large selection of accessories and luggage items, brings together modern trends and classical design elements to create a contemporary and elegantly sporty look. The on-trend color shade copper and eye-catching graphic elements inspired by the futuristic design of the BMW Concept Car Vision Next 100 provide stylish accents. For example, the “Alive Geometry” of the concept vehicle is reproduced in the haptic structure of the BMW Thermal Mug in high-quality stainless steel, as well as in the classy embossing on the BMW Notebook and on the inner lining of the high-sheen BMW Men’s Soft Down Jacket. The copper color shade brings an additional, very elegant contrast to the largely dark blue, grey and white items. The discreet shadow print of the BMW logo on the BMW Ladies’ T-Shirt in organic cotton and the copper-colored zip fasteners of the sporty BMW Ladies’ Sweatshirt Jacket lend the outfits a distinctive style. BMW M Collection – Sporty looks fueled by dynamism and power. By contrast, the dominant shades of the BMW M Collection are Black and Marina Bay Blue. The latter is the official colour of the new BMW M5 and was named after the Formula One race circuit in Singapore. Employing high-tech materials such as carbon – which is used for the roof, rear spoiler and exterior mirrors of BMW’s M models – and Makrolon™ polycarbonate, the BMW M Collection reinforces its claim to elite sporting pedigree. 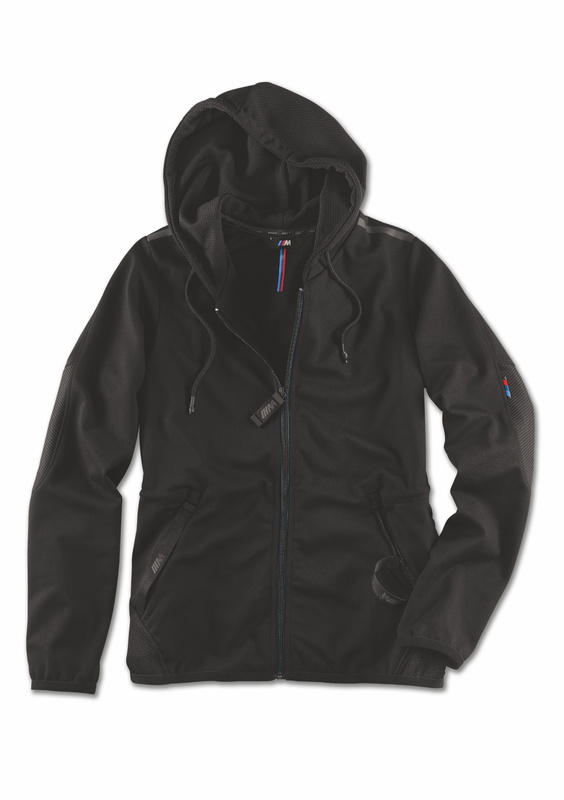 This is true not only of the apparel and accessories – such as the BMW M Women’s Sweatshirt Jacket, with carbon structure on the hood and back section, and the BMW M Rollerball, whose cap features the original BMW M5 paint finish – but also for the luggage items in the collection. The shape of the Makrolon™ polycarbonate BMW M Boardcase is inspired by the roofline of BMW M cars and is complemented to attractive effect by the distinctive carbon-fiber-look foil print in Marina Bay Blue and the four double-rollers featuring the BMW M5 rim design. The BMW i Collection embodies the fusion of sustainability, premium quality, innovation and exceptional design, and offers intelligent products for all areas of life. The apparel stands out not only with puristic forms and understated colors, but above all through the use of distinctive cuts and resource-efficient materials. 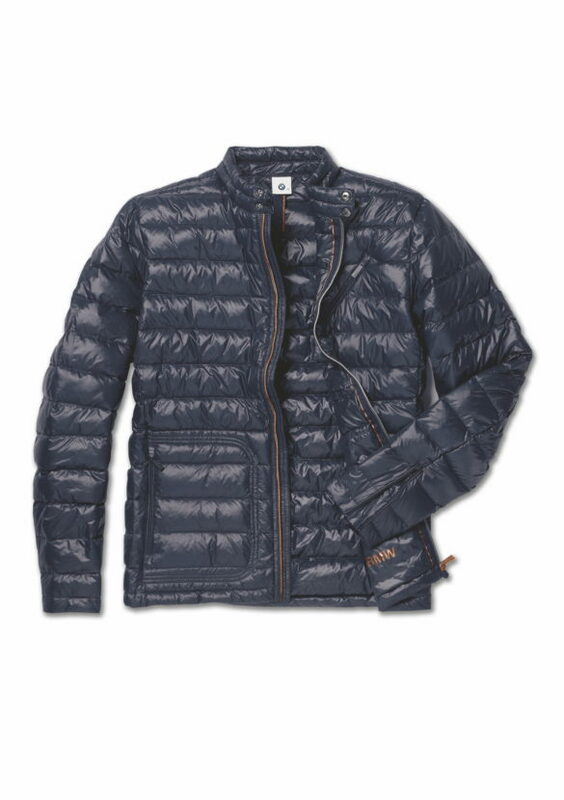 For example, the BMW i Women’s Jacket in organic cotton has an asymmetrical cut, a high-quality lining in an elegantly contrasting colour and a sophisticated design detail: its buttons are made from recycled paper. The importance of conserving resources and enhancing sustainable production has also been taken into account with the accessories in the collection. For instance, “Appleskin” – an unusual vegan imitation leather made from apple fibre – is used for the BMW i Rucksack. Meanwhile, the selvedge residue left over from production of seats for BMW i cars is ingenuously reprocessed for use in the BMW i Pencil Set. A particular highlight of the BMW Lifestyle portfolio is the BMW The Collection. Inspired by the top-end BMW 7 Series Individual design elements and equipped with “Smart Travel Features”, the collection contains an exclusive selection of luxurious accessories and travel items, of which many have been co-developed with two highly credible premium partners: Montblanc and Horizn Studios. 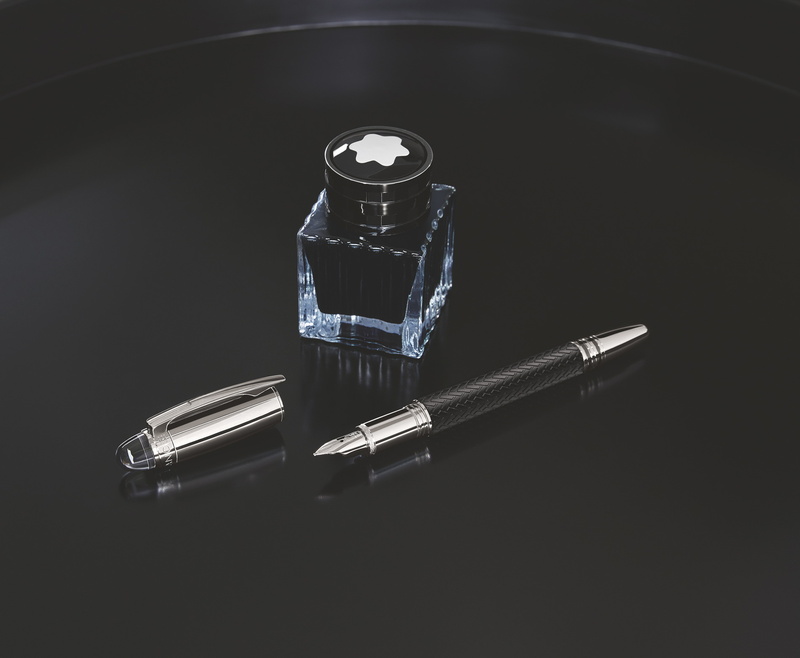 La Maison Montblanc – ambassadors for the culture of writing and purveyors of masterful handcraftsmanship for over 110 years – and BMW have extended their successful partnership into 2018. The collection put together exclusively for BMW includes large and small items made from the finest Italian leather, notably the Montblanc for BMW Pen Pouch, Montblanc for BMW Credit Card Holder and Montblanc for BMW Duffle Bag, and exquisite writing instruments, such as the Montblanc for BMW Fountain Pen with handcrafted 585 / 14 K gold nib and platinum-plated rings. All the products in the collection share a unique Montblanc for BMW design, which takes its cues from the woven-look quilting of the seats in the BMW 7 Series Individual – in the form of either elegant leather embossing or the weave pattern of the royal-blue Jacquard lining. Since luxury also means providing thoroughly conceived solutions for our increasingly digitalized world, BMW Lifestyle has teamed up with international travel brand Horizn Studios to present a pair of chic travel items: the Horizn Studios for BMW Trolley and Horizn Studios for BMW Boardcase. As well as the tough, hard-shell construction made from aerospace-grade polycarbonate, the Italian leather and the low-noise Hinomoto® 360° rollers from Japan in exclusive BMW rim design, this luggage series also appeals with another, extremely practical feature: an integrated, removable power bank with a 10,000 mAh battery and two USB ports. Two models will also be added to the BMW Bikes Collection in 2018. Thanks to its innovative folding mechanism and lightweight aluminium frame, the new and compact BMW Folding Bike makes the ideal city model for quick spins around town. The new BMW City Scooter, meanwhile, offers even greater day-to-day flexibility with its folding mechanism, splash protection and kick stand for convenient parking. 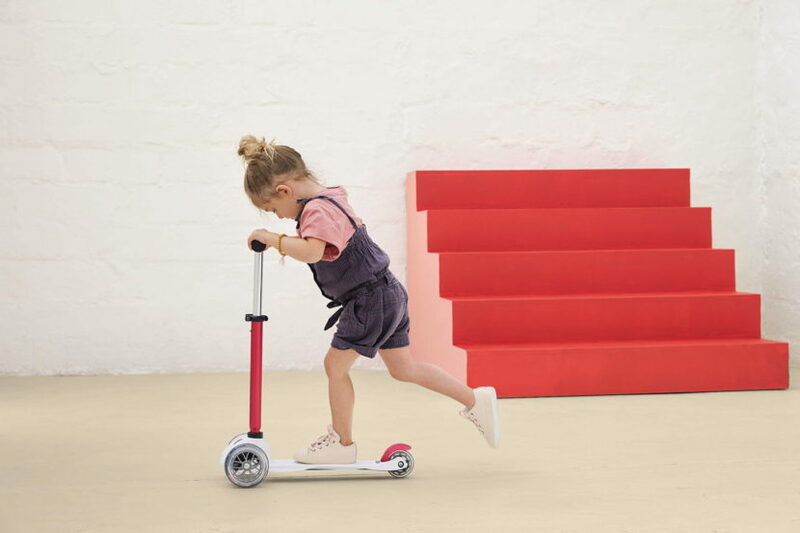 BMW Lifestyle is also appealing to the youngest road users with the addition of the BMW Kids Scooter (in an array of colours) to the BMW Kids Collection. The BMW Kids Scooter can be adjusted according to age and ability, courtesy of a seat and integrated drawer for smaller children or a removable seat and height-adjustable handlebar as a pure scooter for bigger kids. The line-up of BMW Miniatures will also gain a series of new models in 2018. Historic cars like the BMW M1 and BMW 507, and stars of the present day – such as the BMW M6 Convertible – all ensure that every detail of a BMW Miniature will put smiles on faces. The Miniature BMW Vision and Miniature BMW M6 GTLM John Baldessari add two very special models to the collection. The BMW Lifestyle collections are available from April 2018 at shop.bmw.com and from selected BMW dealers. BMW putting people in pens. Most of it looks like fashion show costumes. Some of the products are fine. Expensive, though, so lets hope the quality is extremely good and the clothes comfortable! If not, this is an abomination.